THQ Wireless and Vertigore Games have released a new augmented reality iPhone shooter game called Star Wars Arcade: Falcon Gunner. In the game you shoot down waves of TIE fighters superimposed on your iPhone’s live camera view. In the arcade style shooter your game background is augmented over the real world. For example shoot over the skyline of Manhattan in NYC to create a virtual fighting battlefield. The sound effects are full of Star Wars goodness backed by a full soundtrack and audio commentary as you gauge war on the virtual world. Star Wars settings include Death Star and Hoth. 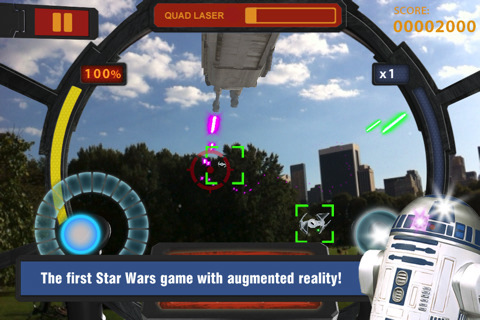 AppSafari review of Star Wars Arcade: Falcon Gunner was written by Joe Seifi on November 3rd, 2010 and categorized under Action, App Store, Augmented Reality, First Person Shooter, Games. Page viewed 7236 times, 1 so far today. Need help on using these apps? Please read the Help Page.